If you’re shopping for a new mattress and looking at models that contain foam, one of the factors you’ll need to consider is mattress density. Also known as mattress foam density, this phrase refers to the mass of one cubic foot of mattress foam (an area that’s 12 x 12 square inches). In non-mathematical terminology, a mattress with a higher density will feel more solid and much heavier than one with a lower density. Many people mistakenly believe that a higher mattress density alone is an indication that a mattress will be harder and firmer than one with lower mattress foam density. In fact, a dense mattress can provide quite a bit of body contouring and pressure-point relief. The foam Indentation Load Deflection (ILD) – and not density – is what determines mattress firmness, as well as how much weight is required to indent it. Together, the density of a memory foam mattress and its ILD give you a comprehensive view of its overall feel. For a latex mattress, a higher ILD will typically indicate a higher density. It’s important, however, to note that the ILD is an entirely different measurement from the mattress density. If mattress density isn’t a direct indication of firmness, why does it matter? In this guide, we’ll answer that question, taking an in-depth look at mattress density and how to choose the best mattress foam density for your body type and sleep style. Why does mattress density matter? As mentioned above, mattress density isn’t necessarily an indication of firmness. If this is the case, how does mattress foam density correlate to its overall comfort level and the way it feels? Let’s explore the subject to find out more. Higher density foams tend to be more temperature-sensitive, meaning that they take on a rather viscous feel as they warm up. Some sleepers enjoy this feeling of being contoured and cradled, while others feel as though they’re trapped and sinking into the bed as though it’s a pit of quicksand. These types of mattresses don’t return to their original shape quickly, making it difficult for people who change positions while they sleep. Lower density foam mattresses don’t react to temperature in the same way, spring back faster, and cause less problems for sleepers who move around a lot. The mattress density level is not an indication of the degree of motion isolation. All memory foam densities, whether they rate low or high, do well at preventing motion transfer. This is particularly helpful for couples where one person moves around or gets in and out of bed frequently throughout the night. While high-density foam provides more body contouring, the increased density also gives more support, pushing the sleeper upwards even as it hugs their body. Low-density foam doesn’t provide a great deal of support. This greater degree of support may be why higher density mattresses rate better for back pain relief than their low-density counterparts. People who sleep hot often point out that memory foam makes this problem worse – and high memory foam density is a common culprit because it traps heat. For a cooler sleeping experience, seek out a mattress with a lower memory foam density that will allow better airflow. Many consumers who choose a higher mattress foam density notice that these options tend to release more of an odor in the initial days and weeks after unpackaging. This is because there’s more foam material present in a denser mattress, and more foam material means more chemicals to create an offgassing odor. If you do choose a mattress that presents a strong offgassing smell, the only cure for this is time and simply letting the mattress sit and air out. A new mattress is a significant investment, so durability is an important factor when making a choice. Customer surveys and reviews indicate that higher mattress foam density correlates to greater longevity. This is because more dense mattresses don’t soften and break down as quickly. A higher density support core is also key because once this layer breaks down, the sleeper will begin to experience pain and discomfort. Now that you have a general understanding of what mattress density is and the various factors it affects, let’s dig in even deeper and look at the qualities of the different mattress densities. There is no “universal comfort” mattress foam density, so it’s important to look at the characteristics of each, talk about how they feel, and consider factors such as your own personal sleeping style and preferences, as well as body size, health issues, and lifestyle factors. Keep in mind that many mattresses have different layers of foam (some that act as a comfort layer and others that act as a sturdy support core), so you may need to consider the density of various layers when making your final choice. Mattresses with low foam density contain 3 lbs or less of material in one cubic foot of mattress space. These mattresses are the lightest in terms of weight. These kinds of mattresses don’t offer a great deal of support, meaning that the sleeper will sink into them to a greater degree. Because low-density memory foam doesn’t react as much to body temperature, it won’t become viscous and constrict movement as much as a higher density mattress, however. Low mattress foam density typically means greater airflow, which creates a cooler sleeping experience and less offgassing. These types of mattresses don’t rate as well in terms of longevity, however, only lasting 5 years on average. The longevity is reflected in the price; mattresses with low foam density are among the most affordable. Ease of movement: Low mattress density allows sleepers to move around with little constriction. Temperature control: Increased airflow creates better temperature control for people who get hot as they sleep. Less offgassing: Lower density means less foam material inside, which translates to less of an odor release in the initial days and weeks after the mattress is unpacked. Little support: The low density of material per cubic foot doesn’t offer much support, especially for sleepers who suffer from back pain. Longevity: Low-density mattresses compress more easily, soften more quickly, and break down faster when compared to those with more material per cubic foot. A medium-density mattress will contain between 3 to 5 lbs of foam material per cubic foot. A mattress with a medium density level will have much more support than one with lower density. The greater density will buoy your body upwards, providing ample support for the average sleeper. Medium-density mattresses contour the body more and provide good relief for sore pressure points around the shoulder and hip areas. They tend to build up higher temperatures than mattresses with a lower foam density level because of the lower degree of airflow through the material. Denser foam material also means more chemicals, which can lead to a moderate degree of offgassing in medium-density mattresses. The materials in a medium-density mattress don’t soften as easily and spring back faster. Medium-density mattresses don’t break down as quickly as low-density mattresses do, which extends their lifespan to 7 to 8 years. 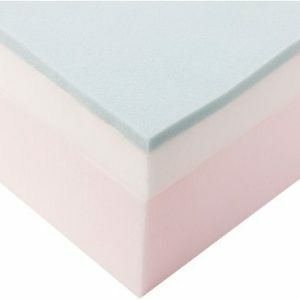 Support: Greater mattress foam density provides a higher degree of support than lower density options – great for sleepers who don’t like feeling as though they’re sleeping “in” the mattress rather than on it. Temperature control: While the more dense materials cause this mattress to sleep hotter than one with lower density, it’s still a good middle-of-the-road choice for sleepers who need a mix of comfort and temperature control. Price: A medium-density mattress is a good mix of affordability and durability. Not enough support for back pain: While the support offered here is enough for your average sleeper, it may still not be enough for individuals who struggle with back pain. Offgassing: While the greater airflow allows a medium density mattress to air out faster than one that’s more dense, any chemical odor may be unacceptable for those with a sensitivity to strong smells. High-density mattresses contain the most foam material, with 5 lbs or more per cubic foot. These are the heaviest foam mattresses. One of the biggest complaints about memory foam mattresses is that they don’t provide enough support and can cause discomfort in people who are prone to back pain. Sleepers who have had this sort of experience would do well to try a high-density foam mattress. Often made with a combination of high-density memory foam and latex foam, these mattresses provide a great degree of contouring while leaving the sleeper feeling lifted and supported. This is why they rate well for pain relief. High-density foam mattresses aren’t ideal for people who sleep hot, however. The dense material traps heat and raises temperatures. Lack of airflow and increased amounts of material also cause higher levels of offgassing odor. 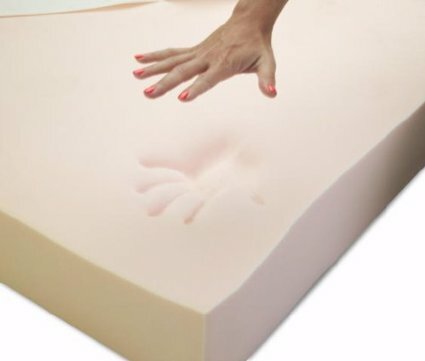 The dense makeup of this type of foam mattress makes it very durable and resistant to compression and softening. The average lifespan for mattresses with a higher foam density is around 9 or 10 years. Support: Providing the greatest degree of support among all types of foam mattresses, those with higher density are the best choice for people with back pain. Longevity: High-density foam mattresses last much longer than their lower-density counterparts. Temperature control: The greater the density, the less the airflow, which means that these mattresses tend to sleep hot. Offgassing: More density means more foam material, which creates a stronger chemical odor. Price: High-density foam mattresses are the most expensive mattresses in this category. Because there is no one-size-fits-all mattress density, which one feels most comfortable to you will depend on various factors. Your body weight, whether or not you have back pain, your favorite sleeping position, and budget are a few things you should consider when researching which mattress foam density will work best for you. Sometimes more than one factor will come into play, so it’s good to understand the way that various foam densities will react to your body to cradle, support, and warm you as you make your final decision. Lighter people typically do well with a low mattress foam density because their body weight keeps them sleeping towards the top layers of the bed. This means that lack of support due to low density won’t be as much of an issue. It also means that they don’t have to spend as much on a higher-density mattress. Average-sized sleepers will need to take more into consideration than simply their body weight, as they can sleep well on any level of foam density. 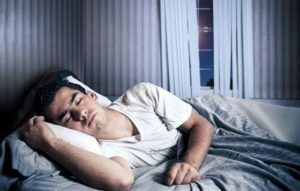 These individuals should take sleep position, whether they sleep hot, and potential back pain into consideration when they choose their ideal mattress foam density. Heavy sleepers tend to push farther down into the mattress when they lie down. This means that the mattress – and particularly the support core – needs to be higher density in order to provide the support necessary to keep them comfortable and prevent pain. Heavy sleepers should typically avoid mattresses made of low-density foam. Low-density foam mattresses can plague people with back pain due to the lack of support, and this is one of the main reasons memory foam mattresses often get a bad rap among those with back problems. These sleepers should choose a medium-density mattress at the least, although high-density foam will provide the greatest amount of support. Because all foam mattresses provide excellent pressure-point relief and contour around hips and shoulders rather than pressing against them, side sleepers can choose any foam density they like. They should take body weight and back pain into consideration to see if they potentially need to avoid less dense options. Back sleepers evenly distribute their weight across the mattress, meaning that they have greater freedom to choose any foam density level. For sleepers who need greater spinal support (and especially those who deal with back pain), a medium- or high-density foam mattress is the best choice. Without the proper support, a stomach sleeper will find their back arching inwards as they rest. This is why people who sleep on their stomachs should avoid low-density foam mattresses, instead opting for a medium- or higher-density choice to keep their spines in proper alignment all through the night. Combination sleepers often move around a lot during the night, so any level of foam density will help isolate that movement if they sleep with a partner. High-density mattresses may restrict movement as the foam warms up and feels more viscous, and low-density mattresses will provide greater freedom of movement. For people on a budget, low-density mattresses provide the lowest-priced option. These mattresses do tend to break down more quickly, meaning that they’ll have to be replaced more often. When considering price alone, however, low-density foam far outpaces high-density foam mattress materials. Seniors must consider two factors when researching foam density. The first is the degree to which they experience back pain, as this necessitates a higher-density foam with greater support. The second factor to consider is how much trouble they have getting in and out of and moving around in bed. Because high-density foam is slow to return to its original position once it’s exposed to body heat, it can restrict movement, and this can be problematic for some seniors. Weight: Sleepers on the heavier end of the weight range tend to feel most comfortable on a high-density mattress, while lighter sleepers can choose a low-density foam mattress. Preferred sleeping position: While back and side sleepers have the greatest degree of freedom in choosing mattress density, stomach sleepers need ample support and sleep better on a high-density mattress. Problems with back pain: Greater support is also better for back pain. Remember that different mattress layers are often made of foams with different densities. A good density for a mattress support core is at least 2 pounds to provide ideal support and remain durable for the life of the mattress, but those with back pain may require an even greater level of density. Tendency to overheat: High-density mattress foam allows less air to flow through, often creating a hot and sweaty sleeping experience for people who sleep hot. If temperature is a problem, opt for low-density mattress foam. Offgassing: For sleepers who are particularly sensitive to chemical smells, mattresses constructed with a lighter mattress foam density are more breathable than those made of a more dense foam material. Budget: High-density mattresses feature more material per cubic foot. They’re more dense, heavier, more durable, and last longer – and this adds up to a higher price tag. For more affordable options, look for mattresses with a lower foam density. Read our reviews of the best foam mattresses to further guide you in the selection process.